Krishna Bharadwaj, Sraffa’s Return to Classical Theory: Change and Equilibrium. 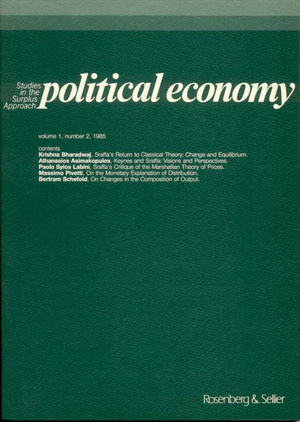 Athanasios Asimakopoulos, Keynes and Sraffa: Visions and Perspectives. Paolo Sylos Labini, Sraffa’s Critique of the Marshalllian Theory of Prices. Massimo Pivetti, On the Monetary Explanation of Distribution.